Insurance claims filed in both personal and commercial lines that will fall to private insurers after the 14th November Kaikoura earthquake have now risen to NZ $1.84 billion (approximately US $1.33 billion), according to the latest data from the Insurance Council of New Zealand. 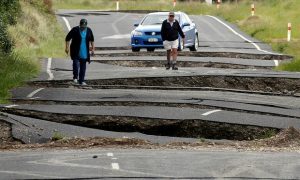 The earthquake struck the Kaikoura area of New Zealand on the 14th November at magnitude 7.8, causing widespread damage to property and infrastructure across the affected regions of the country. The overall insurance and reinsurance market industry loss for the Kaikoura earthquake was anticipated to reach as high as NZ$5 billion or US$3.5 billion, with a significant proportion of that toll expected to be from business interruption claims. The Insurance Council of New Zealand reported today that the total value of insurance claims for the quake reached NZ $1.84 billion as at the 31st March 2017. Commercial losses make up the bulk of this, at NZ $1.36 billion, while residential losses now amount to over $460 million, according to Insurance Council Chief Executive Tim Grafton. “Progress is now moving at a rapid pace, so we have a high level of confidence that most people will have received settlement offers by the end of this year. Forty percent of all residential buildings had initial assessments completed by the end of May compared with 32% in April and 19% in March. Insurers continue to focus on the most damaged areas and are making pleasing progress with 57% assessed in the Upper South Island in May, compared with 45% in April” he commented. Private insurers have now received almost 43,000 claims from the Kaikoura earthquake, with over 31,000 of these for residential properties. Insurers, acting as agents for the Earthquake Commission (EQC), are managing most of the residential building and contents claims. The reported claims and costs do not include any land claims, or house and contents claims that the EQC is managing itself, nor where insurance has been purchased from an off-shore provider, so the overall insurance and reinsurance industry exposure to the quake is certainly higher. In terms of claims settlement, there is some way still to go, although it does remain early days for a quake loss event as these can take years to become fully settled, as seen with the Canterbury New Zealand quakes. 29% of residential property claims had been fully or partially settled by the end of May 2017, up from 21% in April and 11% in March, Grafton explained. For commercial claims, 62% of all material damage claims by number had been fully or partially settled by the end of May, up from 57% in April and 44% in March. Over NZ $278 million of commercial material damage claims have been partially or fully settled already. As we wrote recently, the New Zealand government increased its estimate of the reinsurance recovery due for this quake, raising it from NZ$694 million at the end of 2016 to NZ$814 million at the end of March 2017. That shows that reinsurance capital is paying for a significant chunk of the loss reported so far, helping to make these insurance claims payments possible. Just a few weeks until our ILS Asia 2017 conference, get your ticket now.